My Creative Time: Peachy Keen Challenge #48 & another Sneaky Peek! Good morning my Creative Friends & welcome to another FUN Peachy Challenge! 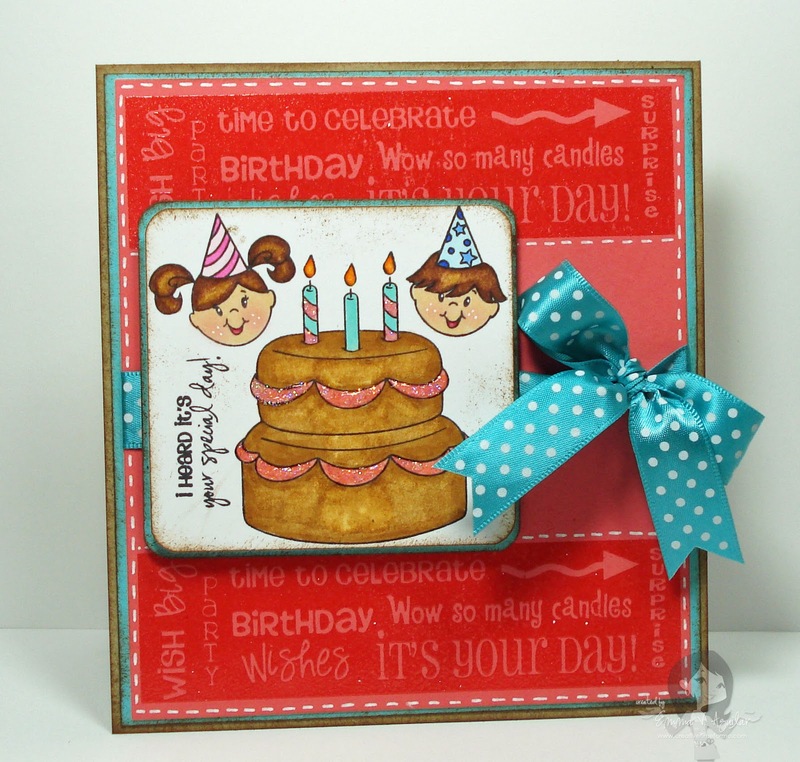 For my card, I used another one of my FAVORITE stamp sets from Peachy Keen "Happy Birthday Kids"! This is the CUTEST CUTEST Birthday set EVER!!! You definitely have to check this out along w/the pink acrylic blocks that will fit this set PERFECTLY!! ;) Did you notice that ADORABLE Border background stamp that is at the top & at the bottom card? Well, that is another one of my Sneaky peeks! I said it before & I'll say it again, Peachy stamps & my Creative time stamps work SO Well together! I just LOVE it! ;) This set is called "Fun Borders" which will be one of my sets I'll be releasing tonight! I think you are going to just LOVE the other 3 that go w/the stamp set! Being that Peachy Keen is the manufacturer, you are guarenteed a PERFECT crisp image! I used clear embossing powder to get this AWESOME look! That sentiment is from my set called "Wow! So Many Candles"! Here is the Prize for this AWESOME challenge! "Spring Words!" Here are the different time zones for the ustream tonight! BELLO!!! I love it!!! That border stamp is really cute!!! Can't wait to play!!! Cute card as always! Love the border stamp too! Another fab card Emma! LOVE everything about it! That beautiful ribbon just sets it all off a treat! Emma, this is so cute! I LOVE those colors together and you're right, the birthday stamps are so adorable! I can't wait to see your new stamp sets tonight! So excited!! EMMA!!!! I am totally flipping out over this OVER THE TOP ADORABLE card!!!! It couldn't be cuter. This is the bomb!!! And I can't wait to get my hands on those amazing stamps. I love the reverse effect, you are SO creative! They are going to make some SUPER duper cute cards!!!! Emma, your card is too cute! The colors are gorgeous, and those new stamps are pretty awesome! What fun things you keep coming up with!! You go, girl!! I hope your DH doing better and that you'll have answers soon! Sending you lots of prayers and BIG hugs! Emma,Great Birthday card!Super job like always!!! cute... cute... will try to be there tonight.. SO CUTE, Emma! I cannot wait to play with these border stamps. They are awesome! great card love the colors and the stamps are awesome. Very cute card! I just ordered my first set of stamps! I'm so excited! I hope I am one of the lucky 75 to get the bonus stamps! Very cute card. I love it. Makes me want that stamp set....posted this, then couldn't stand it and ordered the stamps! emma, I love how bright and fun your card is! just ordered a set too! I hope life is getting back to normal for your family! Very cute card that border is so cool just loved it. Love the colors in the card. So happy!! Very cute card, i LOVE the colors you used! Great work like always! Love all your ideas and cards.